Your children can enjoy lots of fun and develop their learning skills while learning, and form the foundation of reading, writing, calculating, etc. Material: Plastic Magnet. Color: Colorful (Randomly). (26pcs Lowercase letters 26pcs uppercase letters). hope you could understand. Note: Due to the light and screen difference, the item's color may be slightly different from the pictures. Color : Randomly Color (Can not choose). Quantity：52Pcs. Package included:52PCS X Magnetic letters. Please check the size before bidding ,the product in the picture maybe larger than actual one 2 . Pls make sure you do not mind before you bid. 26 Magnetic Letters Children Kids Alphabet Magnets Learning New. THIS IS JUST FOR UPPER ALPHABET LETTERS. YOU WANT TO BUY LOWER ALPHABET LETTERS OR NUMBER???. can enjoy lots of fun and develop their learning skills while learning, and form the foundation of reading, writing, calculating, etc. Can enjoy lots of fun and develop their learning skills while learning, and form the foundation of reading, writing, calculating, etc. Material: Plastic Magnetic. Your children. Model :#1Capitalized English letters. Description: 100% brand new and high quality Color:As picture show Size:18*20mm Material:Wooden Type:Kids Educational Toy Style:Alphabet Printed Wooden Sheets QTY:100pcs/bag Features: A fantastic set of Wooden scrabble letter tiles. Black letters with letter values. Finished to a high quality light wood grain smooth finish. Clear black screen printed letters and number values. Conversion:1 inch=25.4mm or 1mm=0.0393inch Notice: 1. Please allow 1-3mm error due to manual measurement. Please make sure you do not mind before you bid. 2. The colors may have different as the difference display, please understand. Your children. can enjoy lots of fun and develop their learning skills while learning, and form the foundation of reading, writing, calculating, etc. Material: Plastic Magnetic. Color : Randomly Color (Can not choose). Package Contents:15" Globe Inflate Inflatable Earth World Teacher Beach Ball Geography Toy x 1. Brightly coloured plastic inflatable globe. •Super quick and easy to inflate. 36x Fridge Magnet. 36 Pcs Wooden Letters Numbers Refrigerator Magnet Kitchen Fridge Decoration. Material: Magnet wood. We'd like to settle any problem in a friendly manner. A great gift for kids, children and friends. 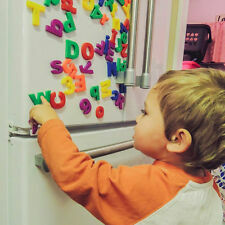 Brand new and high quality ABC Fridge Magnets Let your kids have fun while learning the Alphabet Add instant style to your Fridge, lockers, bedrooms or work space with an attention-grabbing Alphabet Magnet set It is very safe for children! Package include: 26pcs*FRIDGE MAGNET ALPHABET Note:Light shooting and different displays may cause the color of the item in the picture a little different from the real thing. 36x Fridge Magnet. 36 Pcs Wooden Letters Numbers Refrigerator Magnet Kitchen Fridge Decoration. Bring more fun to your family. Letter size range: Approx. We'd like to settle any problem in a friendly manner. 12pcs × Foam Dice. Quantity: 12pcs. Material: EVA Foam. Can be used as dice, can also be used as building blocks. High-quality foam, light weight, no toxic side effects, do not worry about safety issues. Colorful, double-sided activity cards guide children through a variety of fun exercises. Unique curved sticks can be used to create circles and cylinders. Child-friendly pieces are made of soft plastic to ensure safe handling. Puzzle Early Education Toys x1. 8 dice continue to combine different English words. Suitable for children over 3 years old. Scorpion: 2.4 2.4CM. THERE IS A FULL ALPHABET SET OF CAPITAL LETTERS (26), AND A FULL ALPHABET SET OF LOWER CASE LETTERS. ALSO 28 RANDOM EXTRAS, ALL AS PICTURED! Always at a great low price. 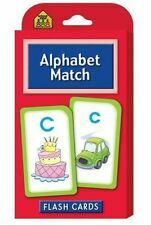 Supports hands-on activities that teach alphabet awareness, phonemic awareness, word building, spelling, number sense and recognition, counting and operations. Magnetic letters and numbers in 4 bright colors. Set of Magnets - All 33 Russian Letters. Kid O A To Z Magnatab 10342 - Sold as 1 Each. Kids writing their first letters will get helpful up, down and sideways instructions via easy-to-follow arrows. A magnetic stylus pulls beads up to create solid lines. From box: From the makers of the original Magnetic Poetry Kit, over 200 mathematical word magnets. A box of words that celebrate the cerebral. Word magnets that stick to any steel surface. The mathematician knows that an equation can be as elegant as an elegy, a proof as poignant as a poem. Korean Basic Initial 50 Alphabet Hangul Magnet Letters Soft EVA Material. Material: EVA, Rubber Magnet. Preschool Toys & Pretend Play. Findings and Tools. Doll Accessories. Baby Children Supplies. 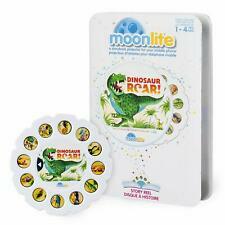 - Can teach your baby letters and colors during their playing. - Good for expanding and practicing your kid's patience, potential, assembly ability and hand-eye coordination. 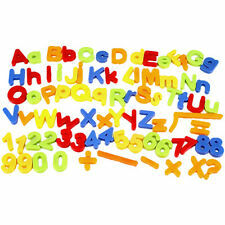 This item is a set of alphabet letters and numbers fridge magnets stickers, which are mainly made of durable EVA material, and can be attached to any iron surface including fridge or whiteboards. It's also a great education way to help your children enjoy learning. 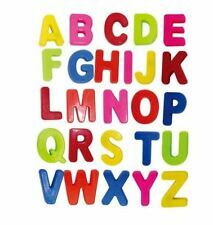 Fridge magnets uppercase blocks set with A-Z Alphabet Letter, can easily teach the children to spell out all the English words. 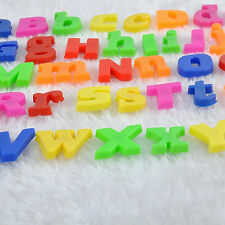 2 Set Magnetic Letters Toys. - Magnet with enough magnetic for better installation and safety. 1 Kongming Lock Set. 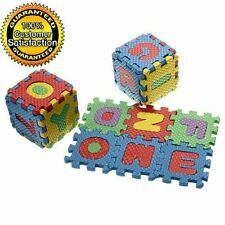 - This set of toy included many pieces blocks, you can use those blocks to assemble many combinations. It is also a great toy for people to relieve their pressure, relax mood and gain pleasure. 10pcs number & 26pcs Alphabet. 1 set of Foam Puzzle (36 pcs). Material: EVA Foam. We will try our best to reduce the risk of the custom duties. Small Piece Size: approx 5 x 5 cm (2" x 2"). Detail Image. 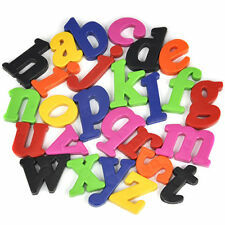 26pcs FRIDGE MAGNET ALPHABET. ABC Fridge Magnets. Let your kids have fun while learning the Alphabet. 1 Set of Fridge Magnet Number. Material: Wooden. Size: about 4.5cm (Approx). Up for sale is a 2003 M&M Limited Edition Counting & Colors Self Correcting Activity Puzzle MINT ! Self correcting activity puzzle, Interlocking pieces. The puzzle has never been opened. Teaches counting and colors. 26pcs in one set. I ncluding 26 pcs English letters and each letter with a sentence to help learning. Type: magnets;. Function: decoration;. Material: paper and cardboard;. Match the colored ball to its animal and number. Five white balls turn into chicken eggs in the coop! All pieces are contained under clear plastic, making it a great toy for travel. Made with wood, plastic, and magnets. 175 tiles. One is missing. This great education set is in good condition. Practice letter sounds and create simple words with this set of letters. Includes two of each consonant in the English alphabet, plus four of each vowel. Consonants are blue, while vowels are red for easy recognition. Set of Magnets - All 33 Russian Letters 3 letters free (А,Е,О). 33 буквы русского алфавита на картонных карточках на магнитах 3 буквы в подарок (А,Е,О) для удобного составления слов.Можно крепить к холодильнику,любым металлическим поверхностям. 36 Pcs Wooden Letters Numbers Refrigerator Magnet Kitchen Fridge Decoration. 36x Fridge Magnet. Bring more fun to your family. Letter size range: Approx. We'd like to settle any problem in a friendly manner. Vintage Lot of Plastic Alphabet Blocks ! · Know what you are buying. Vintage 1978: Playskool Words To Spell Match-ups Complete Set!